Every year, May 4th is celebrated globally as Star Wars Day. This day sees the Internet explode with references to the Star Wars movies and characters. Content in the form of memes, .gif animations, videos, graphic art saturate social media channels on this day. For the uninitiated, ‘May the 4th be with you’ is a pun on the hallowed Star Wars dialogue ‘May The Force Be With You’. The Force has a Dark side and a Light side (translation: bad guys and good guys). 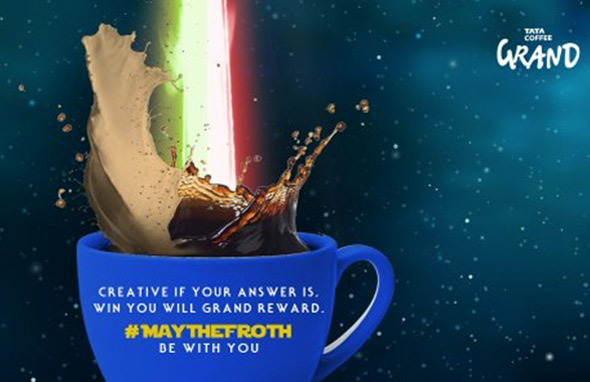 How could Tata Coffee Grand use the force to engage the twitterverse in a conversation that pitted dark coffee lovers versus light coffee lovers? The force answered with a “frothy” idea. 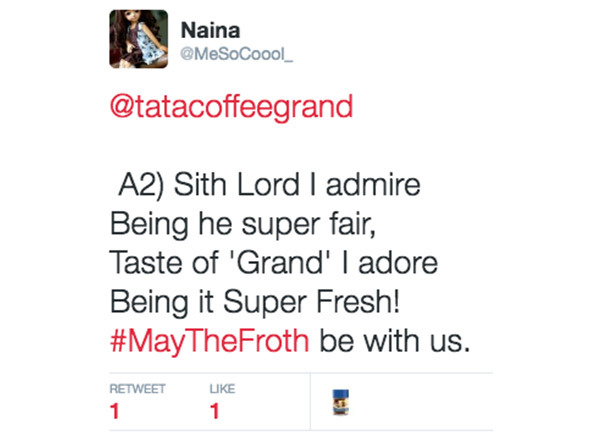 We saw an opportunity to bring Star Wars fans closer to Tata Coffee Grand with a twitter contest that seamlessly blended coffee and star wars mythos. Here, we had a wonderful opportunity to be a part of a global conversation and suffuse it with wit & banter; we also saw the opportunity to tap into an intrinsic connect between our product and the two sides of the force. Raise awareness for the brand Tata Coffee Grand whilst also gently shifting the brand perception. Initiate trials of the product – Enjoy coffee the way it should be (this worked to showcase both product superiority and also how the drinker preferred it)..
There’s only two ways to enjoy a grand cup of coffee - with or without milk; and coffee drinkers are very vocal and particular about this choice. Our campaign hinged on the pun: #MayTheFroth be with you. A random conversation gave birth to ‘May The Froth Be With You’ and that led to the very apparent but cunning play between the dark and the light sides of coffee and the Force. Within the next few hours, we had developed a contest for Star Wars Day fans that would connect their passion for the franchise to Tata Coffee Grand. Which side do YOU pledge your allegiance to? The allegiance (for coffee and the force) were tested and revealed through a series of three questions that were sent out as tweets on the afternoon of May 4th. Each tweet was accompanied by an animated .gif that showed the struggle between the dark side and the light side. Jedi Master Yoda represented the Light Side and the Sith Lord Darth Vader represented the Dark Side. A series of pre-contest tweets and a quick but well-planned influencer push of the contest ensured that the twitterverse was prepped and ready for the same at 3 pm. #Maythefroth was trending nationally for five hours, of which we were trending at number 1 for two hours. In all we got 7.3K mentions on the hashtag with a potential reach of 45M. These tweets in turn returned total number of engagements amounting to 2.5K. Through the activation we engaged with 33 percent of our core audience of active female web users. Moreover we didn’t just engage with the true blue Star Wars fan, but also with coffee lovers.